Basement Conversion - One call and you'll be converted! Need a basement conversion company you can rely on? 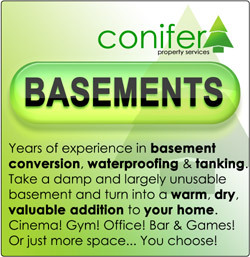 Increase the value of your home with our luxury basement conversion services by Conifer. Specialists in effective membrane damp-proofing methods, and using up-to-date cavity drain membrane and Vandex Slurry damp proofing technology, Conifer's team of experts will convert your disused basement to the living space of your dreams. More living space is always welcome, you may be surprised at the difference a basement conversion can make to your property. How about a home gym? A studio or study? A children's play room? An office space? A pool or games room? Large-screen, home cinema? The possibilities are endless! Offering Professional Basement Conversion: Conifer are a small but very professional damp proofing company with years of experience in basement conversions, our particular specialty is damp proofing to stone buildings and buildings constructed of solid walls (walls with no cavity). We carry out cellar conversions all over the UK including: North and Mid Wales (Chiefly Welshpool, Wrexham, Clwyd, Powys, Gwynedd, Aberystwyth, Ceredigion and Snowdonia Park), Shropshire, Shrewsbury, Oswestry, Telford, Chester and Cheshire West, but we have also converted basements in the Midlands and the North of England. No waiting around for strings of potentially 'hard to get hold of' sub-contractors. Our experienced team will turn up when they say they will, return phone calls and emails promptly and finish the job to high standards so you can enjoy your new basement conversion! Our combination of high quality building work combined with specialist damp proofing knowledge makes Conifer an ideal choice for your conversion project. You can rest assured that your conversion will be waterproofed properly and finished with excellence. Don't foget, a properly insulated basement will positively effect the whole house above. just clean and cosy new rooms! 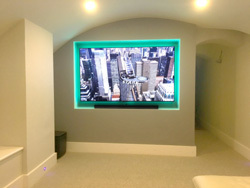 Follow this link to find out more about our company, and see why you should call Conifer for your basement conversion!